So, given his background and his lack of clarification on this matter when asked by Christian leaders, there is justification to label him as a non-Trinitarian until he explains otherwise. The doctrine of the Trinity is essential to our faith, without it there is no faith. If a person denies the Trinity they are in fact non-Christian by this very belief. This is not a trivial matter, why will he not be clear and define the terms rather than mislead by his of semantics? If he believes that the Trinity as defined in the Athanasian Creed is not scriptural, why not just say so publicly? T. D. Jakes denies the essential Christian doctrine of the Trinity. His view is one God playing three different roles or manifestations. He believes in a god that appears in three different "manifestations." Let me quote him, "...One God, but manifest in...three different ways, Father in creation, Son in redemption, Holy Spirit in regeneration." Like one man who is a pastor, father, and husband, this view is called modalism and it is heresy. "God--There is one God, Creator of all things, infinitely perfect, and eternally existing in three Manifestations: Father, Son, and Holy Spirit." Questioner: My first question would be, the Trinity would be defined as one God Who's revealed Himself in three distinct Persons, each co-equal and co-eternal. How important is it for the believing Christian to hold to this belief? T. D. Jakes: I think it's very, very significant that we first of all study the Trinity apart from salvation, and first of all that we embrace Christ and come to Him and come to know Who He is. Having come to know Who He is, then we begin to deal with the Trinity, which I believe is a very complex issue. The Trinity, the term Trinity, is not a biblical term, to begin with. It's a theological description for something that is so beyond human comprehension that I'm not sure that we can totally hold God to a numerical system. The Lord said, "Behold, O Israel, the Lord thy God is one, and beside Him there is no other." When God got ready to make a man that looked like Him, He didn't make three. He made one man. However, that one man had three parts. He was body, soul and spirit. We have one God, but He is Father in creation, Son in redemption, and Holy Spirit in regeneration. It's very important that we understand that, but I think that the first thing that every believer needs to do is to approach God by faith, and then having approached Him by faith, then they need to sit up under good teaching so that they can begin to understand who the God is that they have believed upon." "CRI Coordinator of Research Sam Wall spoke over the telephone with Pastor Lawrence Robinson, Director of Ministry Affairs at the Potter's House, inquiring about their view of the Trinity. Robinson affirmed that Jakes denies the biblical position of the Trinity, at one point saying that the Roman Catholic Church introduced the concept of three gods. Robinson gave some modalistic illustrations of the Trinity and said that Jakes has always held this position. Twice after that, Wall e-mailed Pastor Robinson to confirm the content of their discussion. Robinson never responded. Wall noted in his e-mail, "Should I not hear from you by e-mail, I will assume that these statements by you are correct." Warren Smith: "T.D. Jakes is very popular in the evangelical world, and some people say he denies the doctrine of the Trinity." Norman Geisler: "That's correct. He does. It's an old, old heresy in the Christian church called modalism. I know T.D. Jakes is very popular, and I know people don't like his ministry being called a cult, but it is. It would have been condemned by any orthodox church down through the centuries." Warren Smith: "What does it say about the evangelical church that these heretical teachings have been allowed to creep in so readily, and even when they are identified as extra-biblical, or cultic, a lot of evangelicals just wink?" Norman Geisler: "It says the evangelical church in America is about 3,000 mile wide and an inch deep. Doctrinally, we are very shallow. In North Carolina we are in what is called the Bible Belt, but our problem is that we don't have enough Bible under our belts. We have enough religion to makes us susceptible, but not enough doctrine to make us discerning. You can't recognize error until you can recognize the truth. I'm told that when government experts want to train people to recognize counterfeit currency, they study genuine currency. The same is true with doctrine." "T.D. Jake's letter completely fails to answer charges that he denies the doctrine of the Trinity. Everything he says could be affirmed by any good leader of the (Oneness, vehemently anti-Trinitarian) United Pentecostal Church, for although he distinguishes the Son from the Father, he does so only by distinguishing the human Son from the divine Father—the classic United Pentecostal belief, as documented in my book "Jesus Only" Churches (Zondervan, 1997) and defended in many UPC publications, such as David Bernard's The Oneness of God. Until he clearly affirms that Father, Son, and Spirit are eternally distinct Persons, not merely that they are "three" and "one"—never defining his terms—he should be considered anti-Trinitarian and by no means welcomed to preach in Christian circles." "In his rebuttal Jakes never affirms an ontological Trinity but only an economic one. He speaks of different functions the Father, Son, and Holy Spirit perform, but then he clarifies that he does not believe in three Gods, by which it is fairly clear he means Persons. Even the illustration of H20 taking the forms of ice, water, and steam says nothing about three persons, only three manifestations, and is in fact a common illustration used by modalists to explain their view. The key tip-off that Jakes is a dyed-in-the-wool modalist is his unwavering insistence — both before our article was published and even in response to our article — on using the word manifestations rather than persons in regard to the Trinity. Sabellius consistently avoided the use of the term “persons” (Greek: hypostasis) in favor of the term “manifestations.”...Actually, all of the passages Jakes cites that use the term “manifestation” refer to the Incarnation of Christ (the “manifestation” of the Second Person of the Trinity in human form), except 1 Corinthians 12:7, which speaks of the “manifestation” of the Spirit; that is, the charismatic gifts. None of them are concerned with the doctrine of the Trinity per se, and therefore they do not use the word “manifestations” in the way that Jakes and Oneness teachers use it. In light of all this, it is hard to believe Jakes when he says that the language in his ministry’s doctrinal statement does not derive from modalism. If in fact he believes in the orthodox doctrine of the Trinity, then he can clear this controversy up and satisfy all Trinitarians by simply affirming in his doctrinal statement and in all of his ministry’s teachings that not only does he believe in the Trinity, but he also believes the Trinity comprises three eternally distinct Persons, who together are the one and only Almighty God. If he cannot bring himself to do that and yet still insists that he holds to the Trinity, then evangelicals should understand that it is he, and not his critics, who uses clever semantics to obfuscate the truth." "Don't argue with people about foolishness. Don't argue about the Godhead--the Bible says it's a mystery. If it's a mystery that means it's a supernatural thing and everybody who thinks they understand it--really don't. It's impossible to explain how one God can be three persons and three persons be one God. And you're gonna blow your computer and short circuit your p.c. trying to explain something that you don't even understand. You can't even explain how a brown cow eats green grass and produces white milk. So you know you can't explain God. So just shut up arguing about it and say it's a mystery. All we know is that He's Father in creation, Son in redemption, and Holy Ghost in regeneration and it's all good." 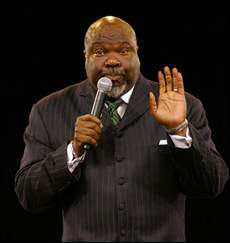 Note: T. D. Jakes says it's foolishness to argue about the Godhead! So when a Jehovah's Witness tells you that Jesus is not God we should just be silent and accept them? He tells us to shut up about it? This is outrageous! After telling us to "Shut up about it" T. D. Jakes goes on to "Explain" the Godhead using a oneness (Modalism) definition. "And God said, 'Let us. Let usssssss...'" says Jakes, and then digresses: "...One God, but manifest in...three different ways, Father in creation, Son in redemption, Holy Spirit in regeneration." "If you need a supernatural thing to occur from God I dare you to give tonight. There's an anointing I believe, there's going to be a supernatural anointing through the word of God. Somebody just give God any kind of praise you got right now! Many people do not understand if you're going to receive something from the Lord you have to be prepared to invest something! So many times people want things out of life without any kind of investment! You can't in the natural, in a stock market you can't get a return on a stock where you have not bought shares. If there's no investment you have no right to wait at the mailbox for a return where you have not made any investment." "My brothers and sisters the power of life and death is in the tongue. You can have whatever you say." "You gotta speak to stuff or it won't change. Are you following what I'm saying?" "When you stop talking back you stop fighting back. Speak to it! You lose your tongue you've lost your fighting power. Speak to it!" "It's what you say to yourself that gets you healed. If you say that you won't be healed you won't be healed. If you say that you are broke you will stay broke. Oh! But I came to serve notice on the Devil. The Bible says, 'The power of life and death is in the tongue. Slap somebody and say, 'You better speak to yourself.'" "Did you know that the Bible says, 'You shall have whatever you say.' Now, don't you say that if you don't want no increase. If all you want is what you had don't say that anymore. But, if you want something beyond what you have ever seen, shout increase! The power of life and death is in your tongue. When you open your mouth you release power all over the room! Shout increase!" "I want the privilege of praying over your seed. I want to pray over your seed and it would be ridiculous for me to pray that God to give it back to you. Because if all He was going to do was give it back to you, you ought to keep it and then you would just have it. That's ridiculous! You got a $100 or a $1,000 and you're gonna give a $1,000 and I tell you God is going to give $1,000 back. Well, you just broke even! You could have kept that $1,000 and not gone through the trouble! Come on church folk! But God is going to give you some more on top of that. And as you sow it [a person shouts, 'Increase!'] I dare you to say it again, [The audience shouts, 'Increase!']. Oh My God! Woo, we're about to get ours in here. I don't know what you're getting out there. Well, we're about, somebody shout, 'Increase!'" "I want to challenge you to sow and come into agreement with me. I believe you don't have to go for it, you can sow for it! And God will bring it to pass in your life. I want you to write me, put in your prayer request and sow a special seed. Believe God for supernatural resurrection harvest in your life!" "I am excited! I have been claiming Genesis 26:12. It is powerful! It is life changing! Talks about Isaac sowing a seed and receiving a 100 fold return in that same year. I believe that as you sow God is going to give you a supernatural harvest in your life! I believe it will be at least a 100 fold! Some of you are going to break into that next dimension of 1,000 times more that I've been teaching around the country. I want you to partner with me so that you can get into this flow...Now write me and let me agree with you in prayer over your seed. As we harvest in this same year 100 fold, a 1,000 times more than expected!" "When you sow seeds into this kind of anointing it releases the power of God that you can harvest. And I want you to get this scripture and read it and believe God with me Genesis 26:12. As we sow, I believe that we're going to experience a resurrection...Genesis 26:12, it says, 'Then Isaac sowed in that land and received in that same year a 100 fold and the Lord blessed him.' This year is your year to receive. You need to sow it and receive it in this year. This is your year of destiny." "Jakes told those gathered that they have to go and claim the inheritance that God has promised them and know that it's theirs. And then he addressed critics who fault him for profiting from "selling religion." 'You can't get upset with me, because I choose to claim what God has promised me,' he said. 'Don't get upset with me! Don't hate the player; hate the game,' a revved up Jakes yelled over cheers." "Don't deny me my joy you player hater you...How dare you sit there and roll your eyes and pass notes when you see me get my breakthrough! you wasn't there when I was in hell's kitchen coming out with some smoke in my coat." "I was staying in a little raggity house down in Dunbar West Virginia and the lights were half way on and half way off most of the time. And the roof was leaking and everything and one night I got up and started walking around in my house and I spoke to the house. And I said, 'House, I don't believe you!' I said, 'You look like I'm down and you look like I'm broke and you look like I'll never be anything. And you look like I'll never get up and you look like I'm bound to the ghetto. But, I just want you to know house, I don't believe you! You're lying to me! You're not who I am and you're not where I'm going and I don't believe You!' I believe that the word that is in me is stronger than the circumstances that are against me. Ah, you all aren't hearing what I'm talking about. You got to start talking to situations or they will take over your life." "Oh! I wish you would sit there and look funny! I wish you would act like you always choose the right door! I wish you would get quiet. I dare you to get quiet on me! I'll start prophesying and tell all your business! You got 12 doors in front of you now! You better say something before I go off! I will go off! I will go off!...I wish you would jump on me! I'll fight everything in here!" "My God! I'm preaching, I think I'll get my own tape this morning." "Ya'll don't hear what I'm preaching. I'm preaching so good I'm about to 'Amen' myself! Oh!...Oh God! I'm preaching good! Hallelujah!" "Oh! That's good! I may have to get this tape myself!" "This tape is so good I'm going to buy this one myself!" "Oh dear! I'm going to buy this tape myself. Give me two tapes! Hold two tapes in the back." Note: Pride is one sign of many that a false teacher possesses (1 Timothy 6:4; Jude 8-19; 2 Peter 2:10-18). "You're entitled to have wellness in your body. Stop begging for what you're entitled to." "We believe that it is God’s will to heal and deliver His people today as He did in the days of the first Apostles. It is by the stripes of Jesus that we are healed, delivered and made whole. We have authority over sickness, disease, demons, curses, and every circumstance in life." Note: He wears glasses yet believes that we shouldn't be sick. Why are his eyes sick? "Jakes lives with wife Serita and their five children in a Dallas mansion, complete with an indoor swimming pool and bowling alley...And while some accuse Jakes of being driven by the dollar and not the divine - his transportation stable consists of a Mercedes-Benz, a Bentley, a BMW, a Lexus and a jet...Indeed, during MegaFest's kickoff, Jakes mentioned his sponsors more than he mentioned God. During the worship service, dozens of Potter's House ushers sprinted throughout the Georgia Dome, collecting purple duffel bags full of money and checks made out to T.D. Jakes Enterprises...The pastor says his income comes from his media enterprises, not from church tithes. And he dismisses such questions as having racist overtones." "The Jakeses and their five children live in a 9,689-square-foot mansion on White Rock Lake, appraised at more than $3.3 million. He loves to shop and wears exquisitely tailored suits and expensive shoes. He owns a jet. "Anybody who has sold 8 million books shouldn't have to justify why they live in a nice house," Bishop Jakes said." Note: That may be true for an unbeliever, but what about for a man of the cloth living in a multi-million dollar house? Dr. J. Vernon McGee has well said, "Whenever you find a minister who is rich, watch out. Folk are not supposed to get rich in the ministry," Commentary on 2 Corinthians 6:8-10, page 117. I drive a: "Lexus and Bentley"
Note: On the Bentley Motors website here is a sample of prices for used Bentleys (Model year then price): 1) 2003--$185,000 2) 2005--$175,000 3) 2000--$159,000 4) 2002-- $279,000 5) 2004--$239,000. Note: Jesus is a product? Jesus is Lord of lords and Kings of kings--the creator of all things. Jesus is not a 'product' nor should He be compared to one. "The one and only prophetess Juanita Bynum will be with us tonight...We're blessed because of you. We're blessed because of your ministry. We're blessed because God has raised up that voice...We thank God for this woman of God...Give God praise for prophetess Juanita Bynum...She has Revelation Knowledge from the Lord." He states that, "because the teachers in Jesus’ day listened to Him as a child it boosted His self-esteem." Jakes mentions that he purchased (for all the men in his organization) subscriptions to the secular GQ Magazine to help them learn about manhood. Note: Paul Crouches new book on prophecy (The Shadow of the Apocalypse) is filled with bible codes. He is scheduled to appear at Mega Fest 2004 with; Creflo Dollar, Juanita Bynum, Joyce Meyer, Bishop Eddie Long, and Paula White. T.D Jakes played this clip of Creflo Dollar on his show on May 24, 2004. He called Creflo one of "God's finest." Creflo teaches that Christians are gods. He also says that Christians are not sinners and that Jesus did not come as God or perfect. He also teaches that it is blasphemy if you don't believe that Christians are gods. They doing all that kind of stuff and God said, “Look here, here is what I am going to do. I ‘m going to kill all of them,” and Moses got in God’s face watch this and he said, “No you will not.” Now how do you figure a man can get before God and tell God what he is not going to do. I will tell you how on the basis of the covenant, he said, “Your not going to kill them because you have a covenant with Abraham, Isaac and Jacob.” And the bible said that God repented or He changed his mind. Quit going before God like a bunch of spiritual sissies and go before God with the covenant on your mind, quit whining before God and go before God like you know your rights. Covenant! Covenant! God has not called you to be a bunch of wimpy men. He’s called you to be covenant men. He’s called you to men of power. Men of the anointing, He’s called you to be wealthy men." "And at the evening sacrifice I arose up from my heaviness; and having rent my garment and my mantle, I fell upon my knees, and spread out my hands unto the LORD my God, And said, O my God, I am ashamed and blush to lift up my face to thee, my God: for our iniquities are increased over our head, and our trespass is grown up unto the heavens," Ezra 9:5-6. "Two men went up into the temple to pray; the one a Pharisee, and the other a publican. The Pharisee stood and prayed thus with himself, God, I thank thee, that I am not as other men are, extortioners, unjust, adulterers, or even as this publican. I fast twice in the week, I give tithes of all that I possess. And the publican, standing afar off, would not lift up so much as his eyes unto heaven, but smote upon his breast, saying, God be merciful to me a sinner. I tell you, this man went down to his house justified rather than the other: for every one that exalteth himself shall be abased; and he that humbleth himself shall be exalted," Luke 18:9-14. "I have heard of thee by the hearing of the ear: but now mine eye seeth thee. Wherefore I abhor myself, and repent in dust and ashes," Job 42:5-6. "For I know that in me (that is, in my flesh,) dwelleth no good thing: for to will is present with me; but how to perform that which is good I find not. For the good that I would I do not: but the evil which I would not, that I do...O wretched man that I am! Who shall deliver me from the body of this death?" Romans 7:18-19, 24. "Then said I, Woe is me! For I am undone; because I am a man of unclean lips, and I dwell in the midst of a people of unclean lips: for mine eyes have seen the King, the LORD of hosts," Isaiah 6:5. "Thus saith the LORD, The heaven is my throne, and the earth is my footstool: where is the house that ye build unto me? and where is the place of my rest? For all those things hath mine hand made, and all those things have been, saith the LORD: but to this man will I look, even to him that is poor and of a contrite spirit, and trembleth at my word," Isaiah 66:1-2. "I indeed baptize you with water unto repentance. But he that cometh after me is mightier than I, whose shoes I am not worthy to bear: he shall baptize you with the Holy Ghost, and with fire," Matthew 3:11. "The centurion answered and said, Lord, I am not worthy that thou shouldest come under my roof: but speak the word only, and my servant shall be healed...When Jesus heard it, he marveled, and said to them that followed, Verily I say unto you, I have not found so great faith, no, not in Israel," Mathew 8:8, 10. "The T. D. Jakes of the next generation could be sitting somewhere back in the back writing notes to somebody across the hall. The next Rod Parsley. The next Creflo Dollar could have been high last night...'How could that be possible? Great men of God like you--they grow up just walking on clouds.'" Ed Young Jr., pastor of Fellowship Church in Grapevine, called Bishop Jakes one of the best communicators he's ever heard. "I have a collection of Bishop Jakes videos in my library," said Young, whose church has a weekend attendance of 19,000. "When I'm feeling down and blasé, watching him inspires me." Note: What a sad day it is when our shepherds that are supposed to guard the flock are promoting a man that denies the Trinity. "His holiness, John Paul II was truly a dedicated and courageous messenger of God. His legacy will be a model that all of us should follow. His Holiness was not only a leader of the church, but also a leader of the world. His life was an example everyone can learn from. His mission to spread the Good News of faith throughout the world, and his dedication to human rights was an inspiration." Used with Permission from www.myfortress.org Blessings, Rev. Wise.